This week’s Rate the Dress is an extremely practical wedding ensemble, for an the bride of an extremely wealthy fabric-weavers son. How will it compare to last week’s anything-but-practical 1920s dress? Mixed reactions to that one. A few of you loved it. A few of you loved it because it was awesomely tacky. Some of you just saw the awkwardness (not helped by presentation, but hey, an auction house isn’t a museum photographing items for display or a book), and some of you just saw the tackiness. This wedding ensemble was worn by Louise Whitfield for her marriage to business magnate & philanthropist Andrew Carnegie. Carnegie was one of the richest men in the US, and at 51 to her 30, was 21 years Whitfield’s senior. He’d refused to marry while his mother was still alive, and the wedding was held six months after Margaret Carnegie’s death. It was, by all accounts, a simple quite affair, probably from personal preferences and due to morning. The Carnegies left for their honeymoon immediately following their wedding, with Louise still in her wool wedding outfit. She was able to wear it numerous other times on the voyage across the Atlantic, and during their honeymoon in England and Scotland, as the ensemble comes with three bodice options. 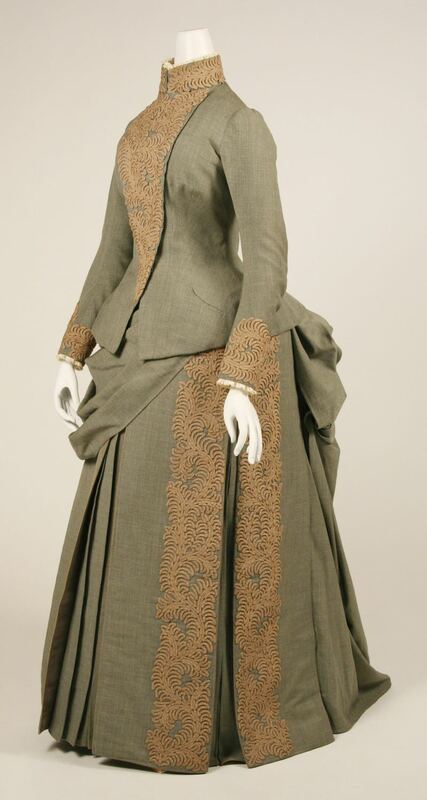 The first option, a longer tailed jacket, made the outfit appropriate as a travelling suit. 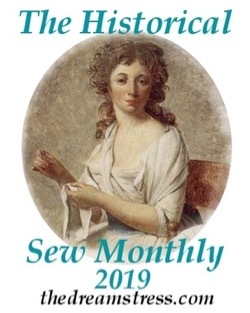 A second shorter day bodice came with two separate button-on plastron fronts: a subdued one with the same fabric and trim as the rest of the ensemble, and a dressier scarlet and gold number, for a little pizzaz. 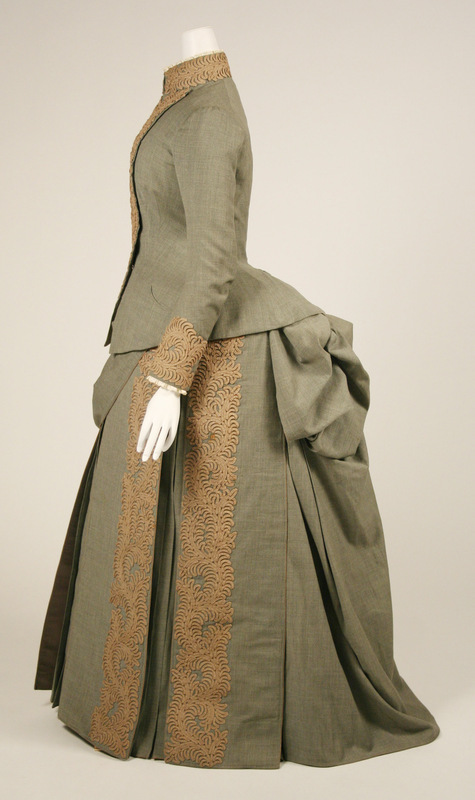 And the tiny curved pockets on the hips of the longer jacket bodice. In contrast to the straight lines and controlled draping of the front of the dress, the back skirt falls into a swoosh of loose asymmetrical bustling. Andrew Carnegie was known for his personal restraint, despite his immense wealth. He famously lived on $50,000 a year (my very rough calculation is that this was about US$150,000-$170,000 a year in 2018 money, and fraction of his actual income), and gave the rest to charity. Louise Carnegie fit the Victorian ideal of a domestic woman, with no aspirations to be a social star. She had her only child at 40, and devoted her life to religion and charity. What do you think? It’s not the traditional wedding dress, but is this an appropriate and attractive alternative for an older (by the standards of the time) bride, with a fairly retiring temperament. And what do you think about the three looks? Do you prefer one over the other? It’s not my favorite color scheme (light olive and antique gold–kind of dull), but the skirt drapes elegantly and the styling is modest but well-executed. The only detail I don’t like is how the first bodice (the jacket-like one) obscures some of the draping at the top of the skirt. Of the three views, I prefer the one with the touch of scarlet–it brings the other colors to life somehow. I think this is gorgeous. Completely appropriate as a quiet bridal ensemble, and so practical with its other wearing options, quite apart from being elegant and beautifully cut. It’s something that I personally would love to wear. I love the color combination, the longer jacket in the actual wedding ensemble and the tape trim design is perfection. The idea of interchangeable fronts and that each is quite different from the other is clever and practical. The red trim against olive and gold has a slightly military feel and is grand. 10/10 Understated gorgeousness, impeccable tailoring, and imminently practical. I honestly wish that we dressed this way…bustle, corset and all! I have a soft spot for Andrew Carnegie – all those libraries in small towns! 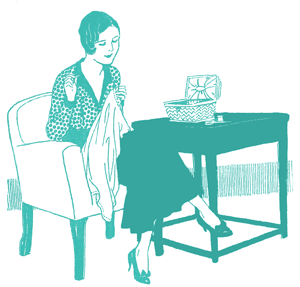 And I approve of a little restraint and frugality – if you are going to spend money on an outfit, you want to get more than one wear out of it. But don’t let anyone be in any doubt that it cost money. Love the wool and the tape braid work. I prefer the first option, with the embroidered panel over the front. The ‘busting out of my buttons’ style always looks a bit odd to me. And I prefer it without the red. Very nice thing indeed. A fine wedding outfit. I’ve always admired this. I don’t think I’ve seen the shorter bodice before; I believe I like it more than the longer traveling jacket (although I ADORE the small, curved pockets on the longer jacket!) I don’t care for the buttoned-on red piece. It just doesn’t seem quite right with this very somber olive drab. I actually find the olive drab wool to be really lovely. The tape lace is just beautiful, and just what this dress needs to add some femininity. I love the very long, full pleats of the skirt. The assymetrical drape adds just enough softness to what might otherwise have been a bit too severe for a wedding dress. I am always wondering how much, if any, the tape lace has darkened over time. If it used to be more ivory I think it would be even lovelier. I can find very little fault with this restrained wedding dress, complete with a longer jacket to leave right after the reception. I would very happily wear this dress myself! It’s glorious. I’m a texture junkie and everything here speaks straight to me. My idea of the perfect bustled dress, especially with the red trim. Although, the longer jacket is very smart too. This is love at first sight for me. The fabric very much reminds me of a modern business suit and this is emphasized by the straight lines in the skirt front and the clean lines of the longer bodice (which is my favourite). I would wear this bodice as a jacket in an instant! 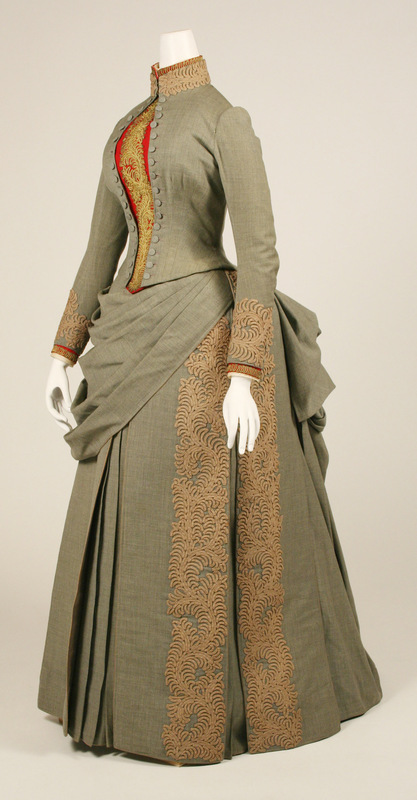 Imagine it with jeans… it would look just as stunning as paired with that gorgeous bustle skirt. A beautiful combination, modest & economical, but not simple. Great handcraft skills und amazing details. I found some pictures with other light, where it looks as a true grey and not so olive as on above pictures. In grey it looks more native and really better then in olive. I prefer the short bodice only with gold trim. The red version looks a bit unmatching and military. I absolutely adore this, in all three variations. Oh 10/10. It’s beautiful. Would that such adaptability of clothes was available these days. Such a delicious combination of the cloth and the pattern. Anyone else would have made this in a showier fabric but this is perfect as far as I’m concerned. And you’re telling me that Andrew Carnegie isn’t available any longer? Ah well, another dream shattered! With the first, traveling jacket option: Absolute timeless perfection. The hips and pockets could be from a 1950’s Bar Suit or modern McQueen a la Kate Middleton’s wedding dress. The other two bodices are less timeless, more trendy and of their period, but why not? Love the sculptural fabric treatment in the skirt; it blends crisp pleats and soft bustling into a tasteful, harmonious whole. The whole thing says quiet confidence and comfortable elegance. Impeccable. Wonderful ensemble in all its variations. Can’t add more to what’s been said. Truly lovely, and a blend of simplicity and complexity. I love the cleverness of the separate bodice choices and the resstraint of the color scheme. Such an elegant & obviously expensive outfit, obviously matching the wearer & probably looked better on her with the right undergarments rather than on the mannequin. A shame there isn’t a photo of her in it. A clever idea having 3 separate bodices I prefer the longer jacket version. Do we know which month they married? Must have been at a cooler time of the year as it’s made of wool & ideal for travelling on a ship. All those cool sea breezes. Wikipedia says she married in April 1887 there are quite a few pictures of her & her husband on the web, some Getty images. none of her in the wedding outfit however. Ooops, typed the wrong # in the title! Now updated! I love that it’s so simple yet elegant, and the color is beautiful. It’s gorgeous, and has a level of dignitas appropriate for a woman of Louise’s age and temperament. My favourite version is the travelling ensemble with the asymmetrical jacket. The colour isn’t my favourite, but for someone with the right colouring it could be stunning. The actual style is gorgeous and I love it! It’s just right for the lady concerned, quality without being showy. Outstanding ensemble, I love the tailoring, the style, the details and the three looks from one outfit. It doesn’t scream wedding to me, the colours seem too subdued even for a ‘mature’ bride but the thought that has gone into every aspect of this dress is truly amazing. I give it a 10. 10/10 for me! Elegant , amazing details, excellent workmanship. Perfect for “clever”girl. Excellent choice for travel ( shows experienced travelller , not novice in crossing oceans). Love all 3 variations. Question: I assume that under the traveling jacket option, she would have worn a shirtwaist or some type of blouse, not just a corset or chemise. 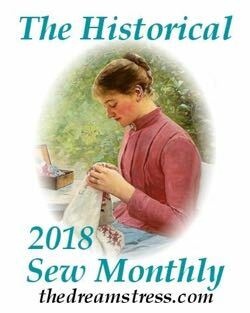 During this period, when would it have been acceptable to remove your jacket and appear in your skirt and shirtwaist/blouse? As far as I know she would have worn a corset cover, and would not have ever taken off her jacket except to undress. 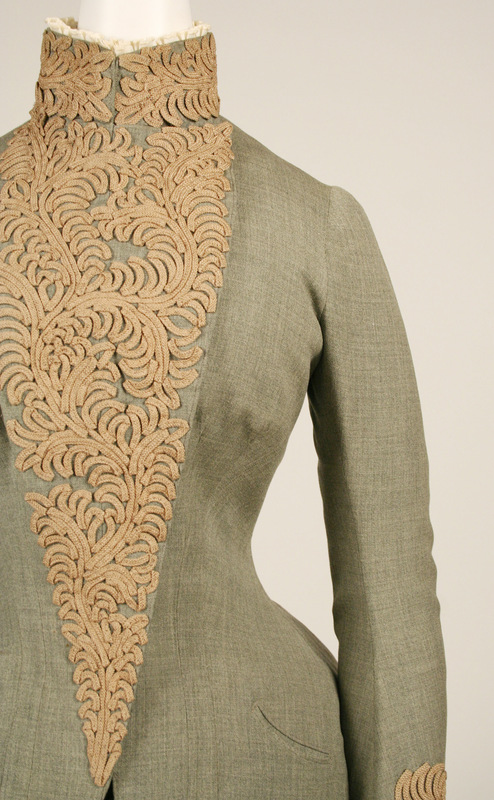 There are almost no examples of 1880s blouses in the modern sense. Have you ever read Pilgrimage by Dorothy Richardson? I’m just reading Pointed Roofs the first book of the series and it is very interesting about dress. It was written in 1915, but set in 1891 and gives such a good description of the main character’s excitement and misgivings about wearing her first blouse. This made me think of Sam Vimes “Boots” Theory of Economic Injustice: I expect that this dress has been pretty economical in the long term, but it must also have been a significant up-front investment. I can also see Lady Sybil wearing it, as somebody who can afford to (and does) live quite frugally precisely because she is extremely rich. Personally I don’t like greens much, but in a color scheme based on muted, darkish, sky blue I would definitely wear it, in all bodice combinations. I can’t decide if I like the red for giving a nice bit of contrast or if the red is too over the top and a bit garish. I keep going back and forth. Overall I like it, the colors are a bit more muted than I prefer, but it’s pretty. I like the skirt and the controlled pleats on the front and the crazy back. 9/10 because I can’t decide on the red. I love it. Quiet yet dashing and that hidden dash of red is just delightfully racy. A dress of many contrasts. Only 1 point off as you have posted things I loved even more. I think this is a brilliant idea for practicality. I can imagine their travels for the honeymoon were a lot less troublesome than for ladies who would have had case after case to hold the numerous gowns. I am just thinking that they could get on with excursions and whatever took their fancy without a lot of palaver over luggage! So, not only practical, but a time saver. Not always back in the state room or hotel to spend a great amount of time changing for the next event of the day. Like some others, I think it is a little drab. But then again, practical for not showing so much travelling dust and dirt. 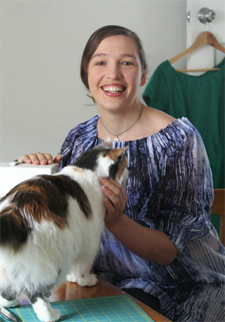 This dress features high on my to-sew-when-I-grow-up-list, but I did not know the story behind it. Now it is even higher on the list! I like that even if you were extremely wealthy, clothing was something you used as much as possible. Quite a difference with the modern fashion industry. But, the dress. Lovely, exquisite tailoring, perfectly communicating the wealth of the wearer and her modesty and practicality at the same time. The ‘stern’ front and softer pleats at the back make a perfect pair. The colors match nicely as well, the floral design standing out without being too dominant. However, despite all this, it’s a bit dull. Practical, beautifully made, but it does not have the ‘wow’-factor of other dresses. This is not modesty, this is almost boring. A lovely ensemble. Beautiful workmanship and details. I especially like the fine gold edge on the sewn in pleats. So smart. i really like it, and would love it if it were grey with black trim. love the front draping on the skirt, the pleats, the fabric bundling at the back. I adore the wee curved pockets. Not sure if anyone else noticed that the neckband and cuffs also differed (and were red and gold to match) for the red front. Next PostScroop Patterns – Pattern Testers Needed!